Random House Books for Young Readers, 9781101931127, 112pp. 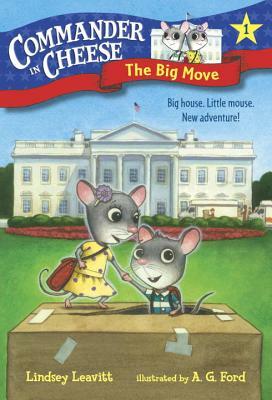 If you are a mouse, then you might know about Ava and Dean Squeakerton. They are kind of famous, for mice. That’s because Ava and Dean and the rest of their family live in the White House. A new president is moving into the White House, and best of all she has kids! That means cool kid treasures for Ava and Dean Squeakerton. Maybe they’ll even find a Lego! There’s only one problem. . . . Sneaking around means Ava and Dean will each have to be as quiet as a . . . mouse. And the Squeakerton siblings aren’t so good at that. But moving day is so busy, nobody would notice two mice searching for toys . . . right? This new series is sure to thrill readers who love tiny details and big fun. Bonus back matter is filled with tons of cool facts about presidents, the White House, and U.S. history. Kids learning about the election will gobble up these adventures! Lindsey Leavitt is fine with mice, but don’t even mention the R-A-T word around her. Her favorite president is Theodore Roosevelt, mostly because of that mustache. She lives in the mountains with her family. Visit her online at lindseyleavitt.com. A. G. Ford is a New York Times bestselling children’s book illustrator and recipient of two NAACP Image Awards. He grew up in Dallas with his mom, his dad, two sisters, and one brother. He majored in illustration at the Columbus College of Art and Design. He lives with his family in Frisco, Texas. Visit him online at agfordillustration.com.